Or what’s right before us. 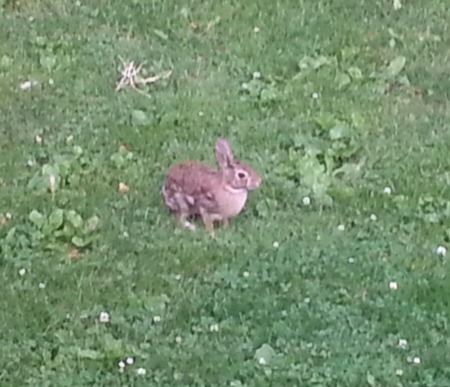 This entry was posted in Uncategorized and tagged fear, rabbits, trust, worry. Bookmark the permalink. You know, when I wrote this, I had NO idea Orlando was in somebody’s sights. What a crying shame that is. Trembling is just a human reaction, I guess. Hope you came out unscathed from the earthquake, Monica! Debbie, must be old age, but I slept right through that earthquake–like a baby! Glad to hear that, Monica! And how wonderful that your two furry friends didn’t wake you up with their whining! Dallas always barks at storms. He’s never experienced an earthquake, but I imagine he’d find a way to bark at that, too. I love rabbits. But my cats tear them apart. Really? Me, too, Professor. One of Domer’s friends had a HUGE rabbit many years ago, and it was such a darling ball of fluff. Cats? You have cats, too, along with your two beastly pooches? Gee, another thing I didn’t know! Well, they adopted me, see. Just showed up, the beasts. I had that happen to me once. It was a cute little grey thing, but never wanted to be petted. Eventually, it moved on. Thank goodness there know that there is so much more good in the world then bad despite what the media chooses to show us. Rabbits can only react…Insightful poem. You’d be surprised how often rabbits hunker down in the back yard and freeze, while poor Dallas goes out to do his business. So often, he doesn’t seem to pay them much mind. Maybe they’re not as interesting as squirrels?? Debbie, I absolutely LOVE this post! Insightful and inspiring! I think I like that line the most because you nailed fear perfectly – when it comes to our fear(s), much remains outside of our control. And it rang especially true for me, having gone through my health scare last October. Yes, that’s what I learned. Thanks so much for sharing this today, my friend. Hope your weekend was great. Have a super week! Ron, I’m blushing at your compliments — thank you! It’s funny about fear, really. It has a way of taking hold and feeding on itself — much the way a fire does — and eventually, it “blazes” way out of control. I imagine the best way to handle it is to refuse to give it a foothold in the first place. Now those unexplained Thumps! in the middle of the night are something else entirely, ha! One of the strangest aspects of my weekend trip is that I didn’t know a thing about what happened in Orlando until well after the event. With no internet, no tv, no radio, and not even a glance at a newspaper, my friend and I spent all our time outdoors, with the flowers, the butterflies and birds. There even was one rabbit. What occurs to me is how unafraid and curious our rabbit was. Perhaps fear is a learned response, as well as a natural one. There’s no question that many in the media and the political world spend the bulk of their time trying to make us afraid. I’m not buying. Everything beautiful and gratifying, I heard recently, is on the other side of fear. I agree. Like love and courage and faith and tranquility.